New Participant: You will have to make a mini handmade journal with a minimum of 10 pages (no smaller than 3x4 /max. size is 5x7, around 2 - 3 ounces) that will be sent to your partner. Make sure your name, username and address is on the last page so it can be returned to you when it is full. Think FLAT and LIGHT - international shipping is much cheaper if you can mail as a letter! Rating is set at 4.97. I will check profiles and I reserve the right to ban anyone I consider a risk: recent 1 or 3 ratings, history of late sends/resends, No newbies (anyone on swap-bot less than 6 months). Returning Participant: Decorate and send out your mini-book from the last round (R40 theme was: Paris. Remember, the journal GOING OUT in this round should have the Paris prompt). When the book is full you will need to return the book back to it's original owner. Message me if you are filling the last spread in a journal. PROMPT: Lace or Ribbon. Use some! Stencil through a bit of lace, draw a ribbon bow, add a lady in lace - get creative : ) Remember: this prompt will go in the book you RECEIVE this round!! Don't like the current theme? use an old one that's not in the book yet! Please comment below with the journal owner's name/ID. I keep track of the journals, but confirmation (for me and the owner) is always nice :) Thanks! 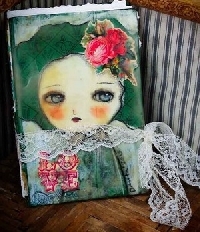 I have the journal from JustMeCreating (Ann Kobberholm). It is in the Netherlands. I’ll be sending a new one I made since this is my first one of these swaps. And i have send today the lovely mini journal from JustMeCreating tot Larina. Sending Jippiefant's journal to Gothbarbie. Sending Midsummerlily's journal to Ace330660. Sending joan's journal to "January"
Oops - sorry not @larina journal; I just received that one. I forget whose journal it was that I sent to @thebragal - sorry! sending Dakota Dee' s journal to Pretty Alice this round. I have received the journal from PrettyAlice.